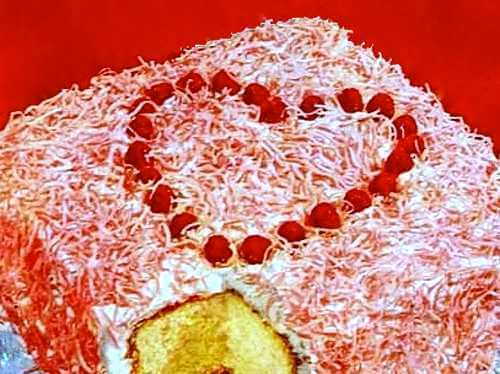 You will love these old fashioned Valentine cake recipes. The beautiful dessert cakes look every bit as special as they taste. They're the perfect cakes for a St. Valentine's Day party, bridal shower, wedding anniversary, or for any special occasion. Select one of the old fashioned recipes and make a delightful dessert cake for your loved one to enjoy. Cream butter, add sugar gradually, then beaten egg yolks. Beat mixture until light and fluffy. Mix and sift flour and baking powder three times. Add milk and dry ingredients alternately, beating after each addition until smooth. Add vanilla and fold in stiffly beaten egg whites. Bake in two large or three small layers in moderate oven (375°F) about 30 minutes. Boil brown sugar and 1/2 cup water until it spins a thread. Remove from fire and pour slowly on the stiffly beaten egg whites. Add vanilla and beat until creamy smooth. Add a drop or two of red food coloring to tint icing to shade desired. Slice bananas over lower layer of cake and pour icing over them. Place second layer on top and cover with sliced bananas. Add 1/2 cup chopped walnuts to the remaining icing before pouring it over the upper layer of bananas. The walnuts are optional in this Valentine cake recipe, and they may be omitted. To begin this Valentine cake recipe, sift flour and baking powder three times. Cream shortening, add sugar gradually, and vanilla flavoring. Then add sifted dry ingredients alternately with milk. Fold in stiffly beaten egg whites. Bake in heart shaped cake pan in a moderate oven (350°F) until it tests done. 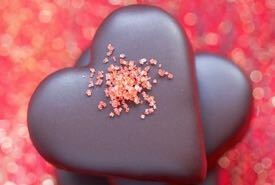 Cover with a white icing and decorate with small red or pink hearts. For a large heart shaped cake, double the recipe, and bake two cakes, one 9-inch round and one 9-inch square. To create the heart shape, simply cut the round cake in half and position each half on one of the square cake's sides. 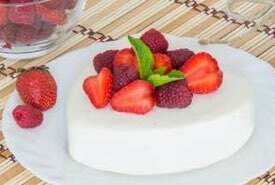 Almost any cake can be easily decorated for St. Valentine's Day with the help of white frosting and red berries such as raspberries, strawberries, or red cherries. Beat on a platter the whites of ten eggs to a stiff froth. Stir into them one and one-half goblets of flour*, sifted six times, adding a teaspoonful of cream of tartar in last sifting. Bake immediately in three large jelly cake tins. Use only two of these, and reserve the other for a strawberry or any other kind of fruitcake. For filling take one pint of very rich cream, add to it two tablespoonfuls of pulverized sugar and a teaspoonful of vanilla. Whip to a stiff froth and color pink with Dr. Price's fruit coloring. Before you begin to whip the cream see that it is very cold. It should be set in a bowl of ice while whipping, especially in the warmer weather. When the cakes are cold, spread between the layers and pile also on top of the cake. *1/2 Goblet = 5 rounded tablespoons flour, approx. Take three eggs and one cup of pulverized sugar. Beat the eggs and sugar to the consistency of batter and then add half a cup of cold water, two cups of flour, and two teaspoonfuls of baking powder, sifted twice. Color with fruit coloring. Use abut a teaspoonful of Dr. Price's fruit coloring, and if not sufficiently colored, add more. Color the dough only. Bake in three layers and fill with whipped cream, sweetened to taste and flavored. Must be eaten the same day. Keep in ice-chest until ready to serve. Two cupfuls of sugar, one of butter, one of milk, four of flour (rather scant), four eggs, half a teaspoonful of soda, one of cream of tartar. Beat the butter to a cream. Add the sugar, gradually, beating all the while; then the flavoring (lemon or nutmeg). Beat the eggs very light. Add them and the milk. Measure the flour after it has been sifted. Return it to the sieve, and mix the soda and cream of tartar with it. Sift this into the bowl of beaten ingredients. Beat quickly and vigorously, to thoroughly mix, and then stop. Take three sheet pans of the same size, and in each of two put one-third of the mixture, and bake. To the other third add four teaspoonfuls of cinnamon, a cupful of currants and about an eighth of a pound of citron, cut fine. Bake this in the remaining pan. When done, take out of the pans. Spread the light cake with a thin layer of jelly, while warm. Place on this the dark cake, and spread with jelly. Place the other sheet of light cake on this. Lay a paper over all, and then a thin sheet, on which put two irons [or something heavy]. The cake will press in about two hours. Cream well half a cup butter, add a cup and a half of sugar, half a cup cold water, two cups flour sifted twice with two teaspoonfuls baking powder, a teaspoonful lemon extract, and the stiffly beaten whites of six eggs. Bake in small shapes for individual servings, frost, with boiled frosting, and ornament with tiny pink candies. One pound of blanched sweet almonds (four ounces of them may be bitter almonds), two pounds of sugar, one pint of the yolks of eggs, half a pint of whole eggs, one pound of flour, and the whites of twelve eggs beat to a firm froth. Pound the almonds with the sugar in a mortar, and sift them through a wire sieve, or grind them in a mill, and mix them with the sugar in the mortar. First mix the whole eggs well with the almonds and sugar, then add the yolks by degrees, stirring the whole until quite light; then mix in the whites, and afterwards the flour, lightly; prepare some molds as for Savoy cakes; but some only butter them. Fill the molds three parts full and bake them in a moderate oven. For almond hearts, butter some tins in the shape of a heart, but without bottoms; cover a baking plate with parchment paper; place the tins on it, and fill them nearly three parts full with the mixture; dust a little sugar on the top, and bake them in a moderate oven. 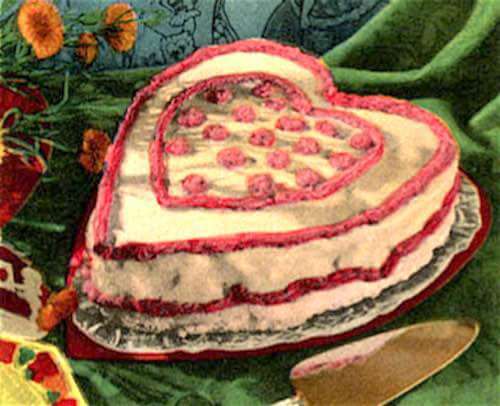 Harlequin cakes were old fashioned favorites. These delicious party cakes in their pastel colors are perfect for celebrating St. Valentine's Day or any holiday occasion. 1/2 a cup of butter, 1-1/2 cups of sugar, 2-1/2 cups of flour, 1 cup milk, 4 eggs, 2-1/2 teaspoons baking powder, 1 teaspoon vanilla. Beat butter to a cream, add sugar, and beat again, now add the yolks of eggs and beat well, add the flour and milk alternately, putting in the baking powder with the last quantity of flour. Whip whites of eggs to a stiff froth, add them very lightly. Lemon Mixture: Rind and juice of 1 lemon, 1 cup sugar, 1 egg, 1 tablespoonful cornstarch, 1 gill water. Mix together the water and cornstarch, and cook them for five minutes; add sugar, lemon, and egg, and cook one minute longer. 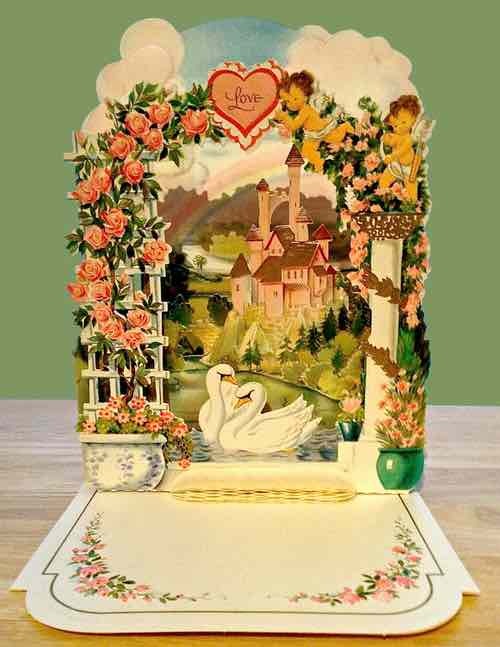 My father lovingly gave the colorful pop-up Valentine to my mother sometime in the 1930s. It must have cost a pretty penny at the time of the Great Depression, but Mom was worth it!